Shortly after I began building my clock, about a year ago, I got an insane job doing insane things for insane amounts of hours per week. Because I spend a lot of time on the road, I needed a more design-oriented project that I could bang out on my laptop for a long time without needing a soldering iron. So I pulled a new project from my bucket list. I want to play around with a time-lapse camera. Time-lapse mold, fungus, and plants growing look totally awesome, so I’ve decided that I want one. Most of the videos you can find on youtube or nature documentaries or wherever are done using a professional lighting rig, a DSLR, and an intervalometer. I don’t own any of those, and if I did, I wouldn’t want to leave my expensive camera in a spore-filled room for long periods of time, preventing me from using it for other things. Make a dedicated time-lapse camera on the cheap. Pretty much all of the materials have been gathered. An old digital camera has been sourced from Freecycle, the important stuff (lens assembly, control boards) fitted into a chassis. 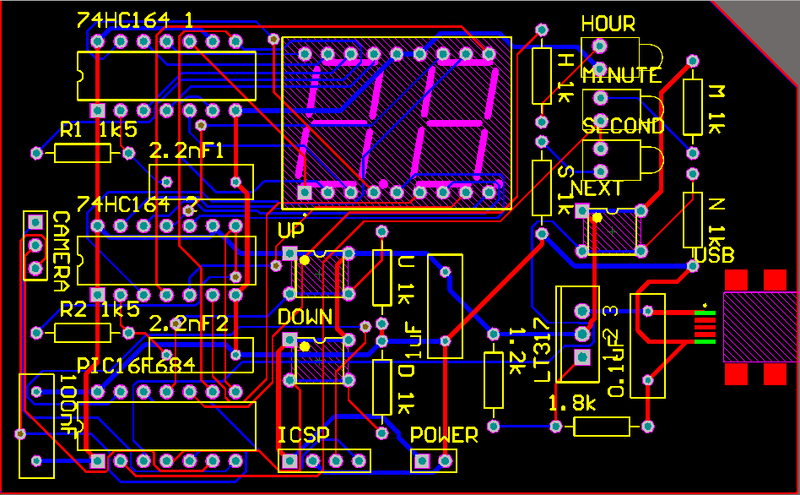 The schematic has been chicken-scratched into my notebook, and the PCB is ready to be etched. I’ve never done that before, so we’ll see how it goes. The PIC code is done, the design is laid out, I just need to build and debug everything. Hopefully I’ll have some real progress soon.